If you’re looking for the best air hockey table, look no more! We’ve reviewed the top five hockey tables on the market, and here they are. A group of Brunswick employees started working on the first air hockey table design in 1969 as a way to give ice hockey fans a chance to enjoy the game in the off season. The game, however, did not become a commercial success until Bob Lemieux became involved. Soon after its invention, college students began to fall in love with the game as a way to compete with each other. The rules were codified and the first air hockey teams were formed. Today, families and individuals enjoy playing the game as much as those first college students. The Playcraft Center Ice is a seven-foot table that offers a 120-volt high output blower, so the action is fast paced. Since it uses 120-volt electricity, it will plug into most household outlets without any special wiring required. 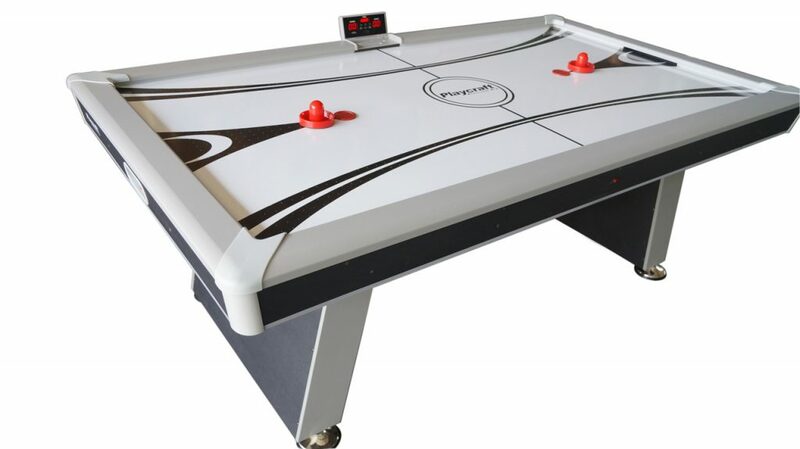 This table also has a .75 inch PVC laminate playfield further enhancing the fast-paced action. Players find the 6-inch pedestal style legs provide a sturdy base for the table’s fast paced action. It is also easy to make sure that the table stays level because this table offers 5-inch diameter leg levelers that can be easily grasped. This table offers players the advantage of an electronic scorer on the side ending any arguments about the score. The scorer can be hidden so that other people cannot see the score as the game is going on. A heavier hockey puck will not fit into the goal openings on this table. 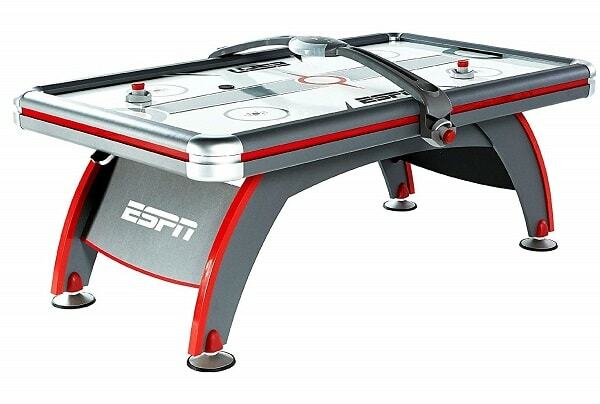 The Barrington Billards EA Sports air powered hockey table is 84-inches long. 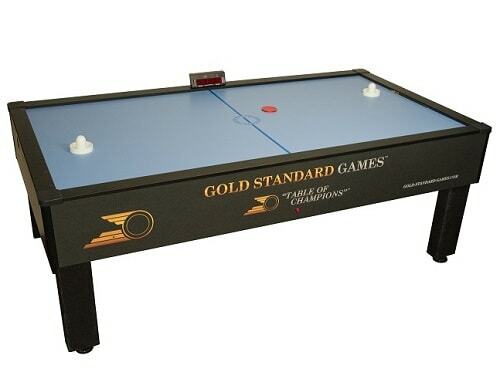 This table offers players the advantage of LED overhead electronic scoring system, the additional thrill of a timer, and arcade sound effects. Furthermore, this table offers the advantage of 6-inch leg levelers that are easy to grasp. Air hockey players can get rough and this table accounts for that fact by offering full panel leg supports, a reinforced top rail, and a reinforced playfield apron. The electronic score keeper on this table offers built-in storage for the puck and pushers along with convenient cup holders. Like most smaller tables, it uses lighter weight pucks. The American Heritage 390074 Monarch Series is 84 inches long. This table is heavier than many other comparable products so it may stand abuse given to it by players better. This cherry red table offers players a unique overhead steel arch and it has large silver pieces on the corner. The surface of this table is screen printed with a starburst design that may help players line up their shots better. This table offers players both manual and electronic scoring. It has a strong blower and operates using 120-volt electricity. This table allows players to use heavier pucks. Some users find that this table is hard to put together. 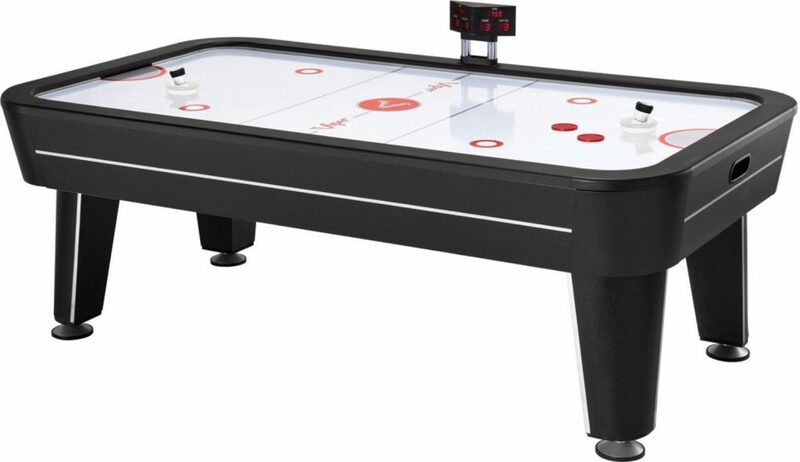 The Viper Vancouver 7.5-foot air hockey game table is six inches longer than other comparable models. It is also two inches wider than most models. This Viper table has a powerful motor that keeps air moving at 110 cubic feet per minute helping to keep the pucks flowing quickly and smoothly. This unit features a black and red electronic score box closely resembling those in ice hockey arenas. The triangular score box contains an electronic timer that can be set for 10-15 minutes or unlimited time. This option allows multiple people to have a turn to play the game. Play is kept even more realistic because the graphics painted on top of the table closely resemble the lines on an ice hockey arena. The graphics are then covered with a layer of lacquer helping ensure they do not rub off. This unit comes equipped with 5.5-inch leg levelers so the table can always be kept level. This Viper table uses the heavier larger pucks. The Gold Standard Games Home Pro Elite was ruggedly designed by completion player Mark Robbins. 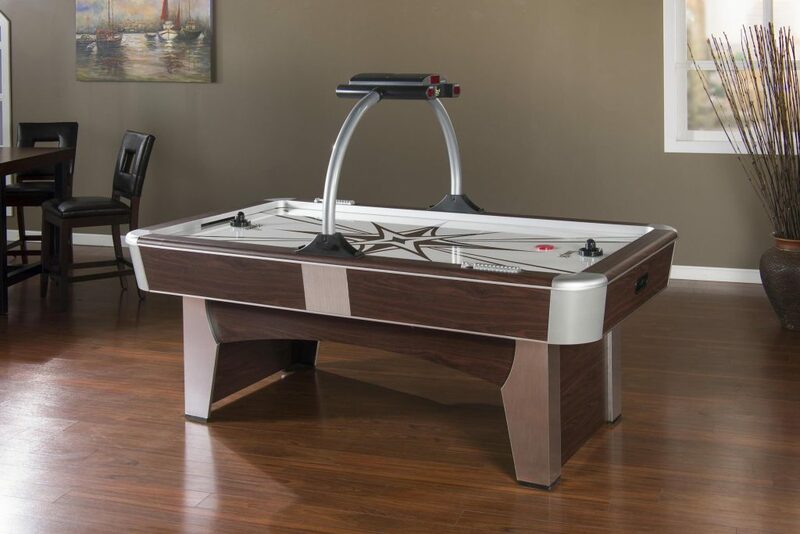 This table features the commercial-grade motor found in commercial arcades making it one of the top contenders. It is designed to use the heavier pucks making it a great choice for players that tend to be rough on equipment. The cabinet aprons and playfield supports are constructed of MDF so they will provide years of enjoyment without cracking. The laminated playfield is bonded to a thick MDF board adding extra strength in this important area. Likewise, this unit contains heavy polymer legs allowing the table to stand even if players bounce off of it. This unit comes with three leg levelers that are each adjustable up to one inch. The apron surface is laminate as in many other comparable tables. Making it easier to keep the puck in play, this unit comes with an extended top rail that is stabilized by concealed rail fasteners. Most players find that the pucks stay on this table well even during fast player. Players can choose from a variety of game options via the electronic scoring mechanism including the first player to reach a certain number of goals or a timed game. This table is 84.75 inches long. This table comes with a 210 CFM blower which produces more airflow than on many comparable tables. After careful consideration, our pick is the Gold Standard Games Home Pro Elite. It has a larger blower than most of the other models, so play will be fast and smooth. This table comes the closest in size to the tables used in regulation tournament play. The well-constructed rails help the puck to stay in play even during the fastest play. This Gold Standard table also provides users with more options in how they want to structure the game. It also uses the heavier pucks allowing players to get a solid hit. While it is the most expensive of the five, you can’t really beat something that is guaranteed to last.